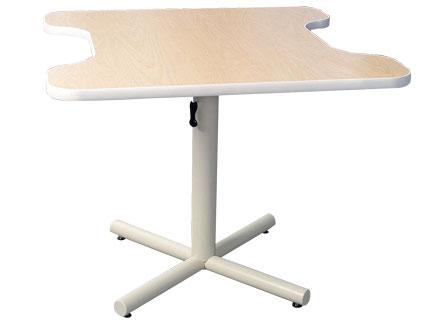 This table was designed exclusively for hand therapists and patients. Now you can achieve the perfect work height for every situation, whether you’re conducting hand strengthening exercises or putting on a splint. The design allows the therapist and patient to sit close to the table, and it offers the smoothest height adjustment available. We use a counter balance system that allows the table to “float” up and down. 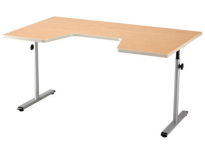 We will match any compedative writen desk/table quote in Canada/USA from an authorized reseller - offer good for any government organization and established business; shipping charges vary. Note: Populas Furniture cabinets/desks/tables/workbenches once shipped from the manufacturer are non-refundable/non-returnable - so please call our trained staff with any questions you may have prior to ordering - we will ensure that you get exactly what you need.